Even if you can't sew, you can make your kids some cute bean bags using balloons. This is a guide about making balloon bean bags. A fun and quick craft to let the kids make for hours of fun. By shaping them in their hands they could shape them like Easter Eggs for an Easter craft. 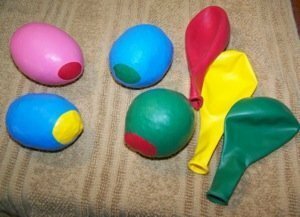 Cut the neck off of the two balloons you want for the color to show on your beanbag. Blow the third balloon up 2/3s and keep it blown up for 30 seconds; let air out and insert funnel in opening. Fill with around 1/2 cup rice or small lentils, cut off hard ring at end of balloon. Lay neck of balloon against the filled balloon. Gently stretch one of the other two balloons over the filled balloon with the neck of the filled balloon on one side. Slip the filled balloon into your last balloon and you have completed your beanbag ball. Vary the size of balls by using different size balloons and amounts of rice. Vary the shape and make them for Easter eggs by rolling them in your hands. Use them for exercise balls for strengthening wrists for adults. The ball should be firm, but squeezable.